President Nuzhat Mahmood and President-Elect Jill Slupe were part of the District 5650 delegation to the recently concluded Rotary Zones 28 & 29 meeting in Chicago. District 5650 was awarded the Membership Development Award for achieving the second highest growth percentage of female members in Zone 28 for the 2016-2017 year. The district was also awarded Membership Development Award for achieving the third highest member retention rate in Zone 28 for the 2016-2017 year. As membership chair for the district, our own President-Elect Jill Slupe accepted the awards. The winners will be revealed in the McKeever Report via our weekly newsletter. 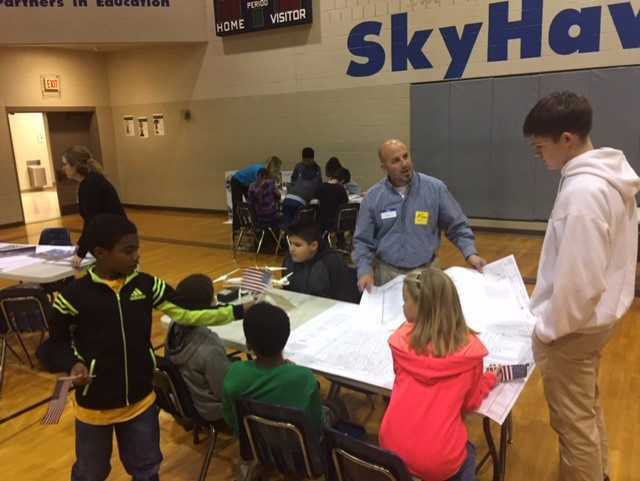 The Career Day at Skinner Magnet Center sponsored by Omaha West Rotary was a very successful event. The Club thanks the Community Service Committee chaired by Brett Wawers for spearheading the event. Doug Zbylut, executive director for Nebraskans for the Arts which is a grassroots organization dedicated to advocating for the arts to federal, state and local policymakers on the topic of arts education and promoting the arts and creative industries in Nebraska. Doug has leadership experience spanning both the private industry and nonprofit arenas. At Nebraskans for the Arts, he is responsible for overall agency operations, program management and development, lobbying, marketing, fundraising, special events, community relations, human resources, finances and board development. Doug previously served as executive director of the Ronald McDonald House Charities in Omaha, deputy director at Omaha Children's Museum. He has also served in the role of government relations at iSecuretrac, where he oversaw lobbying activities and monitored legislation and regulations related electronic monitoring at the federal and state level. Doug is a native Nebraskan and started his career in higher education working in grants offices at the University of Nebraska- Lincoln and Creighton University. Doug received his B.A. in Political Science at the University of Nebraska-Lincoln and a Master’s in Public Administration at the University of Nebraska at Omaha. When Sophia Potter spoke at Ignite Lincoln 9, she was introduced as "Burn your powdered wig and your preconceived notions about who classical music is by, for, and about. Cellist and chamber music evangelist Sophia Potter talks about ..... how to enjoy a symphony, opera, or string quartet concert without falling asleep or surreptitiously checking your Facebook feed. A native of Lincoln, Sophia Potter began her cello studies at the age of 10 when she definitely did not want to play cello. After some gentle prodding from her "classical music only and opera for your birthday" parents, she fell in love and received her B.A. in Cello Performance in 2007 from Oberlin College and her M.M. in Cello Performance from UNL in 2009. In addition to performing with and managing the Rangbrook Ensemble, Sophia is the Director of the Chamber Music Ensemble Program for the Omaha Area Youth Orchestras. She also serves as the chair of the Artist Selection Committee for the Lincoln Friends of Chamber Music series, now in its 52nd season. A staunch advocate for instruments made by living luthiers, Sophia plays on a 2008 William Whedbee cello, which she loves so much she got a tattoo of." Join us at Omaha West Rotary for what promises to be an entertaining and informative talk! 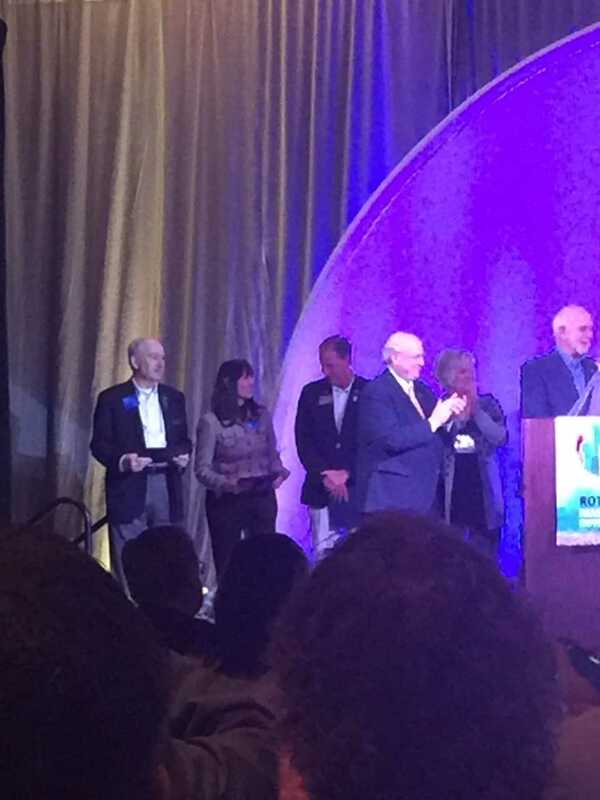 Dr. Tom Cardwell, Psychologist, former Dean of Student Engagement at SCC, serves as this year's District Governor for Eastern Nebraska and Southwestern Iowa, covering 43 clubs. Tom joined Lincoln South Rotary in 2004, and helped start a Youth Leadership camp for high school students in 2011. The camp completed it's sixth year last April, and one of Tom's goals is to see the camp grow to over 100 students participating. Tom and his wife Jenny, also a Rotarian, have a passion for international service. Tom has written several grants with partners in the country of Georgia. The first was to support an orphanage in Saguramo Georgia. Two additional grants were written to develop, and then expand, a mentoring program for college students who had been displaced by war in the region. Most recently he wrote a grant to provide training in Georgia for mental health professionals, teachers, NGO leaders, and parents on how to work with children with behavioral problems. For our district, Tom's goals for 2017-2018 include having a district wide tree planting in the spring, focusing on how to prevent sexual trafficking in our district's area and empowering women. LGT Transport is a trucking company specializing in nationwide transport of cyrogenic product. Pam Spacarotella is its owner, and this company was chosen as the 2nd Congressional District’s top small business for 2015 by the SBA based on its history as an established business, growth in number of employees, increase in sales and unit volume, response to adversity and innovation in products and services offered. LGT started with a fleet of five cryogenic steel trainers and a single office in Omaha in 2013; two years later, the company operates more than 40 self-contained trucks for steel cryogenic, aluminum nitrogen, aluminum argon and carbon dioxide operations from locations in Nebraska, Ohio, Texas and California. This, Spacarotella notes, despite being turned down by more than 10 banks to finance the business, and competing for customers against larger, more established firms. Moreover, LGT's revenues more than doubled and net income quadrupled from 2013 to 2014. Spacarotella, an Air Force veteran, also is active in the community, including participation in Omaha "Ten's" networking and support group for women entrepreneurs. What are we doing as a society to impact the health and housing for seniors? Michael Robinson talked to us at #Rotary about an inter generational approach to these topics at Notre Dame Senior Housing in Omaha today. Good to learn about the good work of the Notre Dame sisters today! Honor and Remember Flag presentation for a fallen hero, "Johnny" Charles Hein Jr.
Courageously turning tragedy into a source of information and education! Blake and Kathy Collingsworth, Rotarians who lost their dear baby boy when he drowned in a pool, spent time with our club today to encourage everyone to teach babies as young as 1 year to learn to float on their back... drowning kills 4,000 kids aged 1-4 every year. Teach kids to NEVER go to water without a parent, the same way you teach kids to look both ways when crossing the street. Thank you to the "Josh the Otter" program for educating all of us. Brad Ashford is a 5th generation Nebraskan and served in the US Representative seat for Nebraska's 2nd congressional district from 2015 - 2017. He was formerly a member of the Nebraska Legislature, representing the 6th district from 1987- 1995 and the 20th district from 2007 - 2015. Born in Omaha, Nebraska, he attended Westside High School, and earned a BA from Colgate University in 1971, and a JD from Creighton University School of Law in 1974. He served on the Business and Labor, Judiciary and Urban Affairs committees in the Nebraska Legislature and has been an advocate for public education, raising special education standards and ensuring fair pay for Nebraska teachers. While serving in the U.S. Congress, he served on the committee on Agriculture and Armed Services . Ashford's rating in congress was among the most bi-partisan members of the 438 House members, as ranked by the Lugar Center. While in Congress, he secured funding for a new, internationally vital Ebola Training and Education Center in Omaha, passed a federal law to bring a new Veterans Affairs medical facility to Omaha, and secured funding for repairs for the runway at Offutt Air Force Base. Ashford is married to lawyer and health care executive Ann Ashford and father to John, Ellie and Tom. Omaha West Rotary honors a Police Officer and Firefighter nominee every year for its "Professionalism in Service" awards. 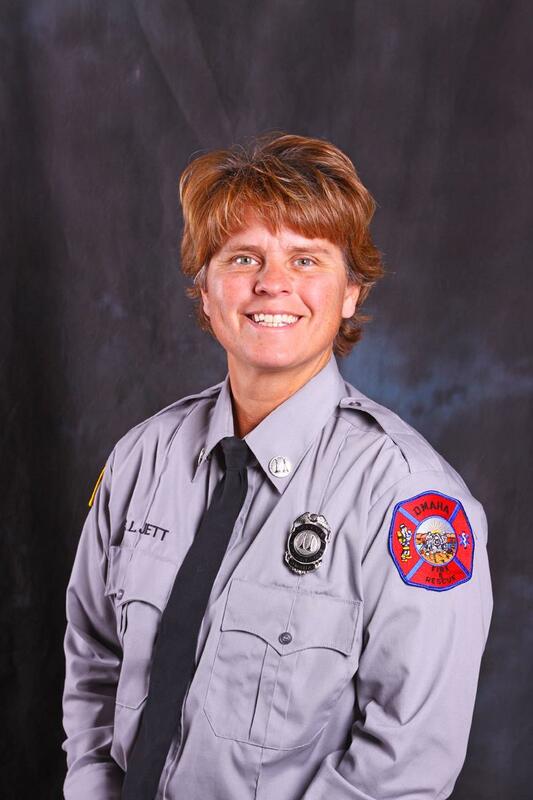 This year's recipient from the Fire Department is Captain Sheri Jett, who has continuously demonstrated professionalism in her service. Fire Chief Daniel Olsen recommends her as "highly deserving of this prestigious honor" and Acting Assistant Chief Lloyd Rupp will be attending this meeting to speak in support of her receiving this honor. 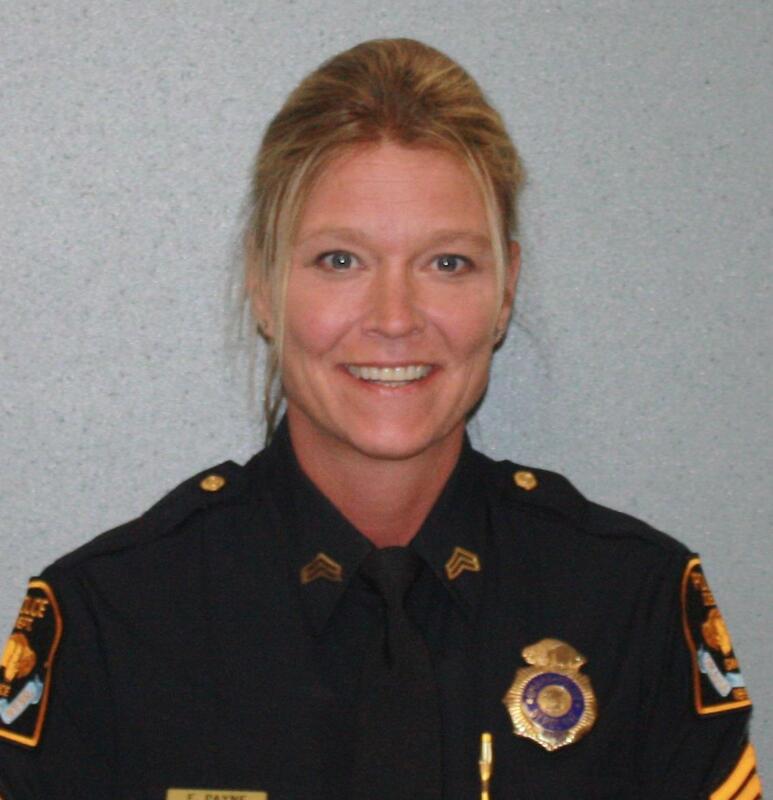 The Omaha Police Department will present this award to Sergeant Erin Payne for her numerous community programs and efforts that directly benefit Omaha's citizens. Officer Payne planned a significant portion of CSI day, is a liaison for the Omaha Coalition of Citizen Patrols, on the selection committee for the mayor's neighborhood grants, is a driving force behind the Omaha Police Department's use of the NextDoor app, works with metro area schools on their safety plans and is the Sergeant for Business Watch, Crime Prevention Unit, Nuisance Task Force and Volunteer coordinator. Come attend this meeting to share your gratitude to these outstanding public servants! Burke Harr is a Democratic member of the Nebraska State Senate, representing about 36,000 residents in Omaha's District 8 around Dundee, Benson and Creighton Prep. He was first elected to the chamber in 2010. Harr grew up in Omaha attending Creighton Prep, then earned his BA from the University of St. Thomas in 1994 and his J.D. from the University of Notre Dame Law School in 1998. His professional experience includes working as a founding partner at Flatwater Strategies and as an attorney at Kutak Rock and Douglas County Attorney's Office. in the 2017 legislative session, Sen. Harr serves on the Agriculture, Revenue, Tax Modernization and General Affairs committees. Harr has campaigned on strengthening Nebraska's crime laws and fighting high property taxes with tax relief and affordable housing, incenting re-development and fostering job creation, providing quality education for all Nebraska's children, protecting Nebraska's natural resources and reducing dependence on foreign oil. "New Developments around the Omaha Metro"
Jay Noddle has been in commercial real estate since graduating from the University of Denver in 1980. Jay has been a business and civic leader in the Omaha community since 1987, having founded Pacific Realty Group, Inc (once Grubb & Ellis and now Colliers in the region). Beginning in 2003, Jay became President and CEO of Noddle Companies and has lead that organization ever since. Jay provides leadership to diverse groups and build consensus among stakeholder. His experience in structuring public/ private partnerships and managing their implementation has resulted in many successful community projects. Current development projects include HDR's 10-story LEED Gold Version 4 Global Headquarters in Omaha's Aksarben Village, the master planning phase of the 500-acre Boys Town West Farm and DeMarco Farm near 144th and West Dodge, the i-90 / Highway 370 Commerce Center and the 30-acre River's Edge Mixed-Use Project on the eastern side of the Missouri River in Council Bluffs, Iowa. Jay is past president of the Jewish Federation of Omaha and remains active in MECA and many other civic endeavors. He enjoys spending time with his children and friends. He is a devoted "soccer Dad" and avid scuba diver, along with being a sports fan for many of the area's teams, running, traveling and listening to music. Ryan Whitt's career has carried him across many functional lines of risk management, payment solutions, bank services and investment management. Over this time, he learned valuable lessons and insights into developing and marketing systems and services to the financial services industry. He currently serves as Director of VBOverified, which offers B2B services to non profit organizations, small and large companies and contracts with state and federal agencies to provide pre-employment and volunteer screening, tenant search services for rental property, and professional services including business due diligence for merger and acquisition activity, insurance benefit cost offset and other services. Being CyberSafe is a 21st century skill that adults and kids, professionals of all stripes, homemakers, college students, retirees and casual web surfers all need. As the world grows increasingly complex, online, and connected between machines / things and people, those who would make our identities and online information unsafe are active and resourceful. Each of us needs to be vigilant and resourceful in maintaining our online safety. Come hear this engaging speaker on a very current and important topic! 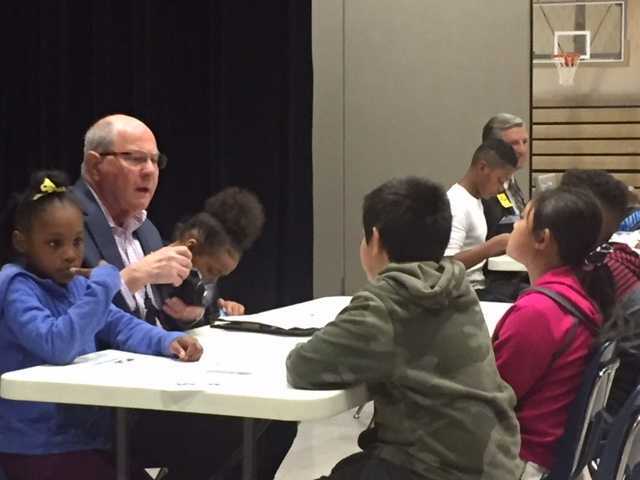 "The Dream of Having a Future for Kids"
"The Dream of Having a Home"
John Wiechmann became president and CEO of the Midwest Housing Equity Group (MHEG) in 2012. His passion is to have a more hands-on approach to helping finance affordable housing development, a passion that he has demonstrated throughout his career. Prior to joining the Midwest Housing Equity Group, Wiechmann had a successful law career in the affordable housing industry at Kutak Rock law firm in Omaha, Nebraska. In 2002, he began his career in the firm's tax credit practice, working primarily with low income housing tax credit syndicators such as Midwest Housing Equity Group. In that role, he worked on moving institutional capital into meaningful real estate developments that would provide good, safe, and affordable places to live. After rising through the ranks of the law firm over a period 10 years, he made a decision to join Omaha based Midwest Housing Equity Group as CEO. His unique background of legal and business skills in the affordable housing industry has helped MHEG expand its reach from four states to 10, operating in Arkansas, Colorado, Iowa, Kansas, Minnesota, Missouri, Nebraska, Oklahoma, South Dakota and Northern Texas. MHEG places approximately $175 million in low income housing tax credit equity each year to help developers build affordable housing. Over the last 23 years, MHEG has built homes for 54,000 people. John Wiechmann and his wife and two daughters live in Omaha. "2017 Healthcare Trends – Breaking the Inertia"
A 1999 graduate of UNMC College of Pharmacy, Dr. Handke has previously served as senior vice president of providers and products at Blue Cross Blue Shield of Nebraska. In this role he oversaw provider networks, pharmacy, medical management and product development functions. Dr. Handke now serves as CEO of Nebraska Health Network, a unique collaborative partnership between Methodist Health System and Nebraska Medicine that has served the Omaha and surrounding areas over the last seven years. Dr. Handke's role at Nebraska Health Network is to create new partnerships with insurers, employers and brokers to find ways to deliver high quality care in a sustainable, cost efficient manner. 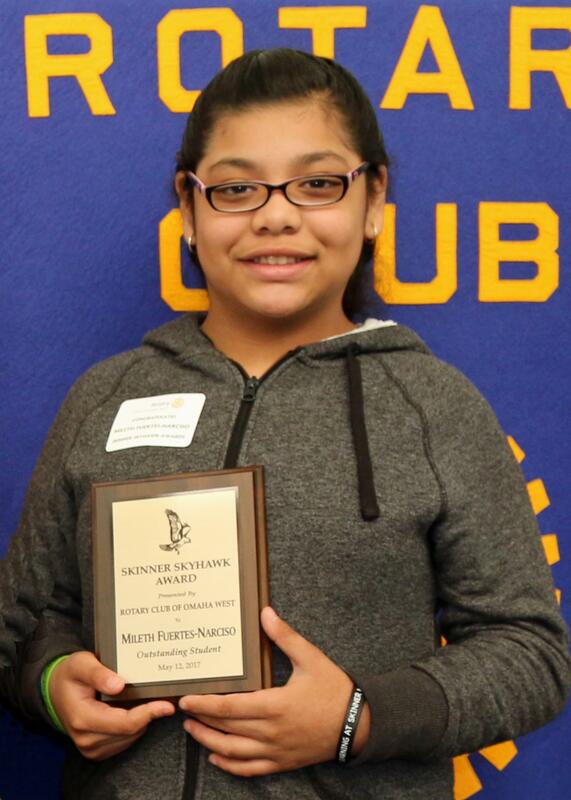 Congratulations to Devin Holmon and Mileth Fuertes-Narciso, both are 5th grade students at the Skinner Magnet Center Elementary School. 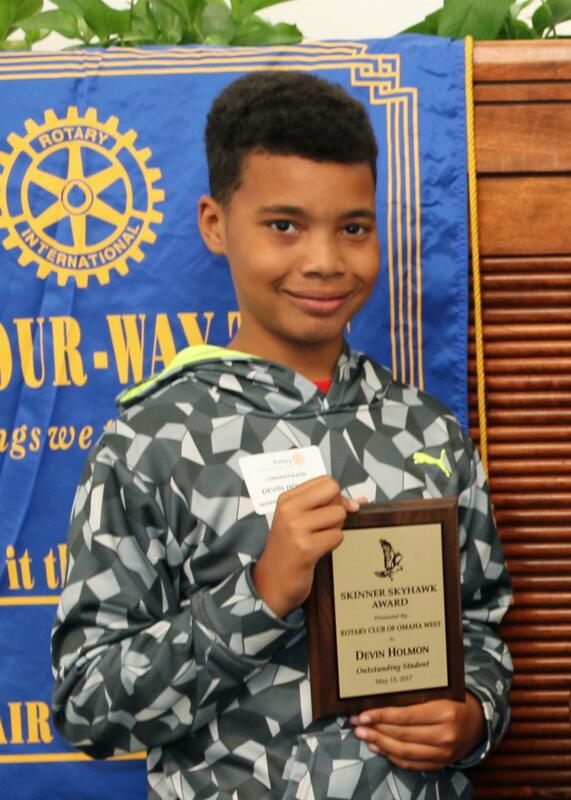 The students have excelled in their schoolwork, taken advantage of educational opportunities offered at Skinner, and have been positive role models for others at school. The student's parents and other family members joined Rotarians as these outstanding 5th graders were recognized for their achievements. Principal, Mrs. Tarina-Cox, spoke about the students as well as Skinner Magnet Center updates. Librarian, Bobbie Martinie, attended the program and was thanked for her assistance in the club's Rotary Readers project at the school. The private tour cost $8 and included a pint of beer at the start of the tour and a sample of vodka during the distillery part of the tour. A great time was had by all! 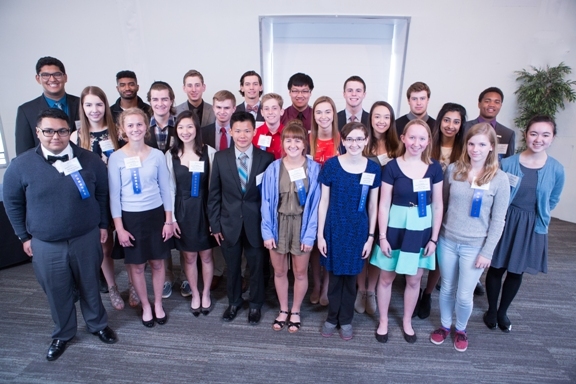 Twenty-five Outstanding Seniors from twenty-five area high schools were honored on April 28th at the 61st Annual Rotary Senior Recognition Day program held at Champions Run. Dr. Jeffrey P. Gold, Chancellor of the University of Nebraska Medical Center, was the keynote speaker and Priya Kukreja. Millard North High School, was the student speaker. Students, parents, counselors, principals, superintendents and guests attended this event. Omaha West Rotary Club, Suburban Rotary Club, Omaha Southwest Rotary Night Club Rotary Club of Omaha and Millard Rotary all participated in a meal packaging project on Saturday, February 25th. This was a multi-club Rotary District 5650 Grant Project. Members, family and friends all worked together to package over 27,000 meals for people in need in the Omaha metro area. A special thank you to Brett Wawers who helped organize the project. Thank you to the following volunteers - Gretchen Radler, Dennis Duer, Susan Thomas and husband, Steve Hutchinson; Mark Ellsworth, Karin Lombard, Rodge Bickerstaff, Brett Wawers, Kent Templien and Juli & Mia; Martie Cordaro and Sara, Cass & Colin; Russ Iwan, John Morey, Ron Niederhaus, Brad Rohrig, Luke McNeese, Manny Paz; John Philo and Jack & Corrie. The Community Service Committee thanks members that contributed to the "MITTEN TREE PROJECT" in January. Donations totaling $395 dollars were collected and will be used to provide warm clothing and needed health and hygiene supplies for the children at our Adopt-a-School Partner, the Skinner Magnet Center Elementary School. Your support for this project is appreciated. Congratulations to Dennis Hein, the winner of boxing gloves autographed by world champion boxer, Terence Crawford. The West Omaha Rotary Foundation will receive $315 as a result of the raffle drawing for the gloves. 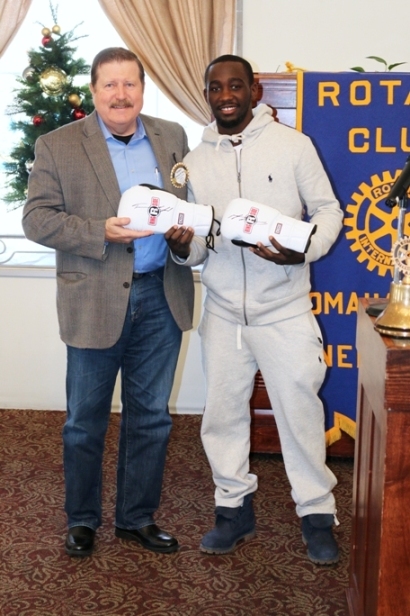 Thanks to Martie Cordaro for inviting Terence Crawford to our Friday Rotary meeting. It was a good program with information about the renovations planned for the B&B Boxing Academy. Terence announced in October that the building in north Omaha housing the boxing academy needs repairs and renovations. Crawford purchased surrounding property and is asking the community to help raise money for the building renovations. Terence mentors dozens of kids after school at the north Omaha warehouse. The Academy can be a safe haven for neighborhood kids. The planned renovations will provide an improved space for training and activities that will keep the kids off the streets and out of trouble. Phillip McClain, business manager for Terence Crawford, can be contacted at procity24@yahoo.com or phone 773.640.6935 for information about donating to help support the renovations at the B&B Boxing Academy. Terence Crawford was interviewed by KMTV following his presentation on Friday, December 18th. You can click the following link to see the interview http://www.kmtv.com/news/local-news/championship-boxer-terence-crawford-speaks-out-against-omaha-violence . CHRISTMAS TREE RECYCLING - Thank You Volunteers! Thank you to the volunteers that helped with the Christmas Tree Recycling project on December 26th and 27th. 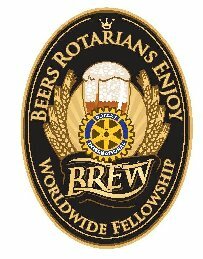 A great opportunity for Rotary volunteers! The Iowa Mission of Mercy is coming to the Mid-America Center September 11th and 12th this year. It is a major event for the metro area where over 200 dentists come to town and do as much free dental work over the course of two days as they can. People will be coming from across the states of Iowa and Nebraska to receive free dental care. In years past, we have seen over 1,500 patients and done over $1 million of free dental work. It travels from city to city in Iowa and it has never been to Council Bluffs before. The Council Bluffs Mayor and Wendy Schultz have been instrumental in making this come to fruition, and now they would like to enlist the help of the rest of the Rotary district members. West Rotary donates funds annually for the purchase of children's books for the Skinner Elementary School library. Bookplates recognizing our weekly speakers are placed in these books by our Community Service Committee members before they are placed in the school library. The books purchased this year are listed below. A note from RI President K.R. Ravindran. On 11 August, we marked a tremendous milestone: one full year without a single case of polio caused by wild poliovirus in Africa. The magnitude of this achievement can hardly be overstated. A polio-free Africa has been within sight, so near and yet so far, for over a decade. The hard work and commitment that have brought us to this point have been nothing short of heroic. Tens of thousands of health workers reached hundreds of millions of children with vaccine, in some of the most difficult conditions imaginable. Together, we have done what once seemed impossible: We have stopped polio in Africa. Yet this progress, momentous as it is, is still fragile. As long as polio exists in the two remaining endemic countries of Pakistan and Afghanistan, the virus still has the potential to spread and to spark new outbreaks. Now, more than ever, we need the power of all of Rotary to carry us through to the end: not just a polio-free Africa, but a polio-free world. Firefighter Brent Van Scoy and Lt. James Pauly were both honored last Friday at the noon Rotary luncheon meeting for their outstanding service in their respective departments. Fire Chief Kanger spoke on behalf of Firefighter Van Scoy and Lt. Darci Tierney spoke on behalf of Lt. Pauly. Congratulations to both recipients!